City trucks – the ones that sweep the streets, haul garbage and plow snow – are essential to keep a city operating properly, but they are all rather limited in the scope of their usefulness. Instead of having three separate fleets of trucks that do one thing each, why not combine them into a kind of super-truck? That’s the idea behind designer Michal Markiewicz‘s Multifunctional City Sweeper Concept. 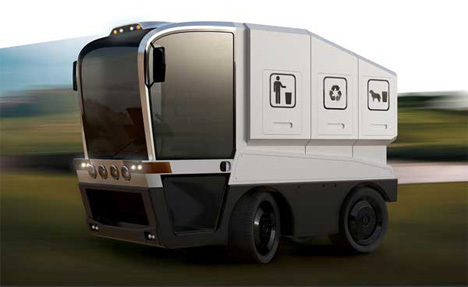 The concept truck would sweep the streets in the morning and gather trash in the afternoon. In the winter, it would plow the streets to make them safe for residents to drive on. Combining the three functions together would save on gas as well as storage space for trucks that are only used seasonally. Perhaps the Multifunctional City Sweeper isn’t yet a fully fleshed-out idea. 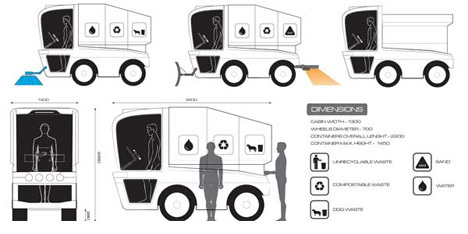 One thing the design ignores is the fact that garbage trucks are huge in order to fit in a lot of garbage. The crews usually work from sunrise to sunset, five to six days a week, just to pick up all of that trash. When would trash crews also find time to use their trucks for sweeping and plowing? Still, the design is an elegant answer to the vehicles that sit locked away and unused for a large portion of the year. Perhaps a more efficient idea would be to simply combine the sweeper and plow trucks since the two are rarely used in the same portion of the year. See more in Concept Vehicles or under Transportation. April, 2013.